As a high school student in Iran, Negar Abedi dreamed of going to university in Canada. She didn’t know what she would study, but Canada’s reputation for welcoming newcomers made her think this was the best place to figure it out. 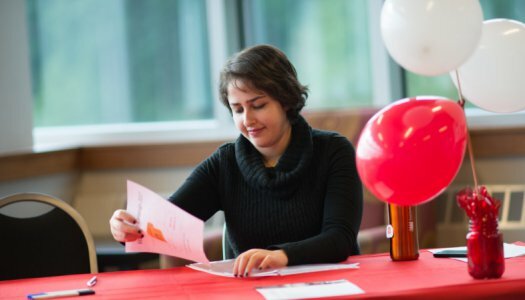 Now into her second year in the Bachelor of Business Administration–Business and Sustainability program from Royal Roads University, Abedi has excelled inside and outside the classroom, catching the attention of both faculty and community organizations. “I heard about her long before I ever met her because her reputation was starting to develop in year one,” says Todd Thexton, assistant professor and director in the School of Business. Thexton first met Abedi at a BBA information session. At the time, she was wavering between studying business or tourism. Apart from studying full-time, Abedi represents on-campus students as the Royal Roads University Student Association vice president. She volunteers with the Canadian Cancer Society regularly and works part-time as a student activities assistant in the student engagement office. Her role is to coordinate Student Engagement’s community service leadership project which connects students to meaningful opportunities to give back to the community. Abedi recently initiated a baking program at Pacifica Housing, a charity that provides services for those dealing with the effects of homelessness, mental health or addiction. 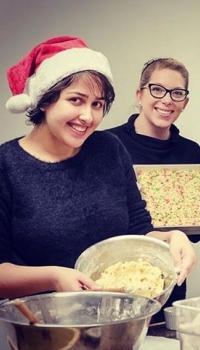 Students and residents meet monthly to make cookies and other sweet treats. Despite the small time commitment, students gain a lot of experience says Claire Clarke, student engagement coordinator. “Ideally they’re able to translate that into the rest of their lives and into what they’re learning in the classroom,” she says. Before moving to Canada, Abedi says she was “shy.” It’s hard to believe that the outgoing student wouldn’t have described herself as a “people person” just one year ago. Now she says she has the confidence and networking skills she needs to be successful in school and in life. “The environment and the community in Canada is so different. People are accepting of who you are and your ideas even if they disagree. I didn’t really have that luxury before. This new environment opened the door for that side of my personality to come out,” she says. Abedi says her community service work has inspired her to explore career opportunities in the non-profit sector after graduation. Thexton says he’s certain she has big things ahead.